What is in Activity Group News? 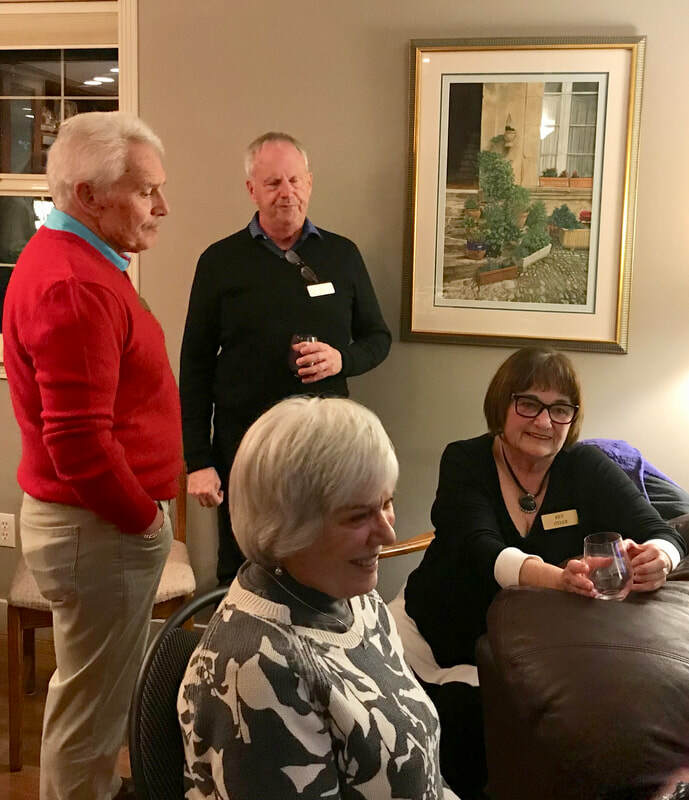 Activity Group News Posts are like blog or FaceBook posts and cover the entire history of the Glacier Probus Club, you can scroll down and all the way back to our beginnings in September 2013. 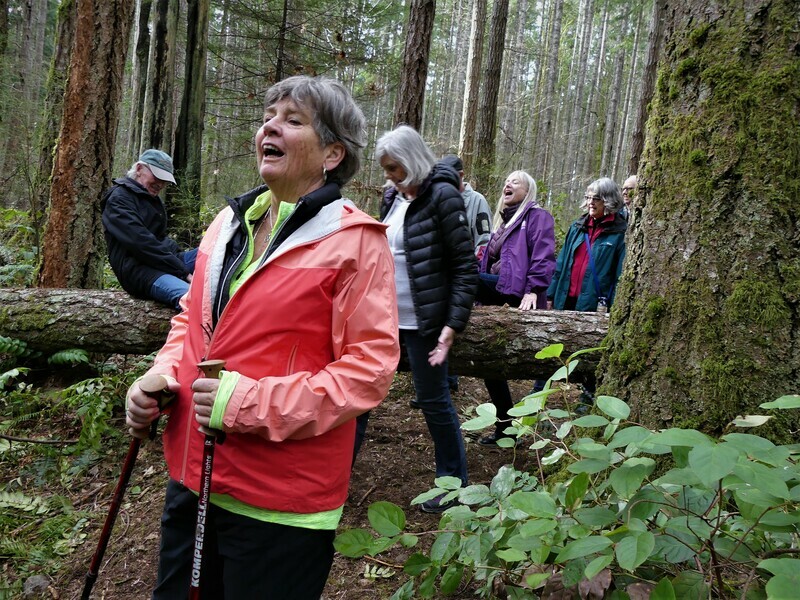 A small group of hikers headed up to Campbell River's Snowden Demonstration Forest today, to check for Trilliums along the Lost Lake/Lost Frog trail system. 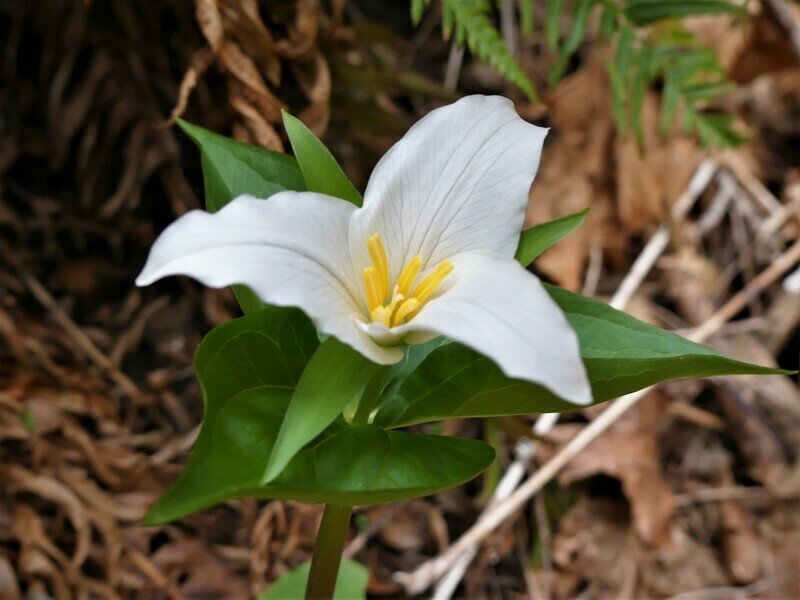 We have been successful in past years in finding double-petalled Trilliums; not many of the flowers out today, but we did find one double one amongst them. As usual, we enjoyed the varied scenery and soaked up the many shades of green seen throughout. Our debrief was held at the Riptide, where Lawrence celebrated his first Snowden hike with a slice of cheesecake - and sure seemed to enjoy it! 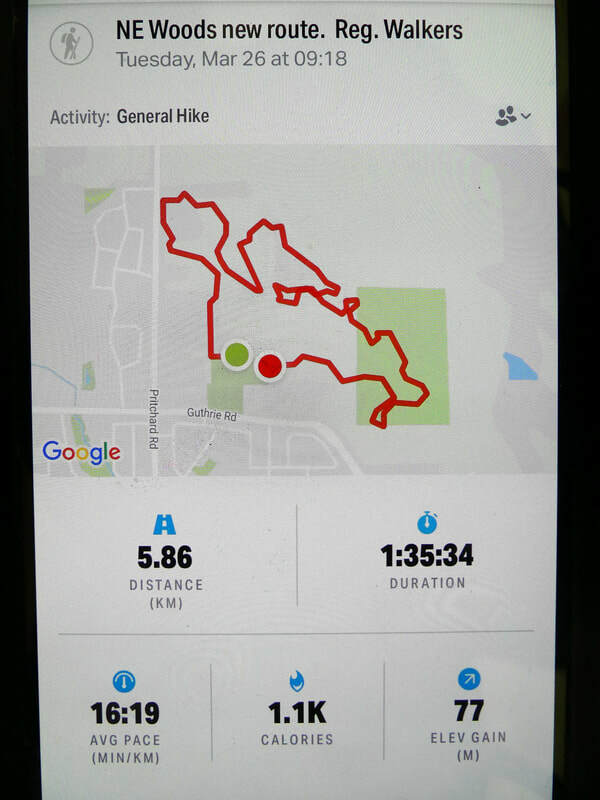 ​This week was the pub to pub walk from Salmon Point. Regrettably fire is too much in the news recently, and the sight of the Salmon Point restaurant badly burned, and behind yellow tape is very sad, as it has a panoramic view across the Straits, and was a great place for us to have our coffee after a walk. Hopefully it will be operational by next year. Our photos (thanks Bill and Dawn) show some interesting woodwork. 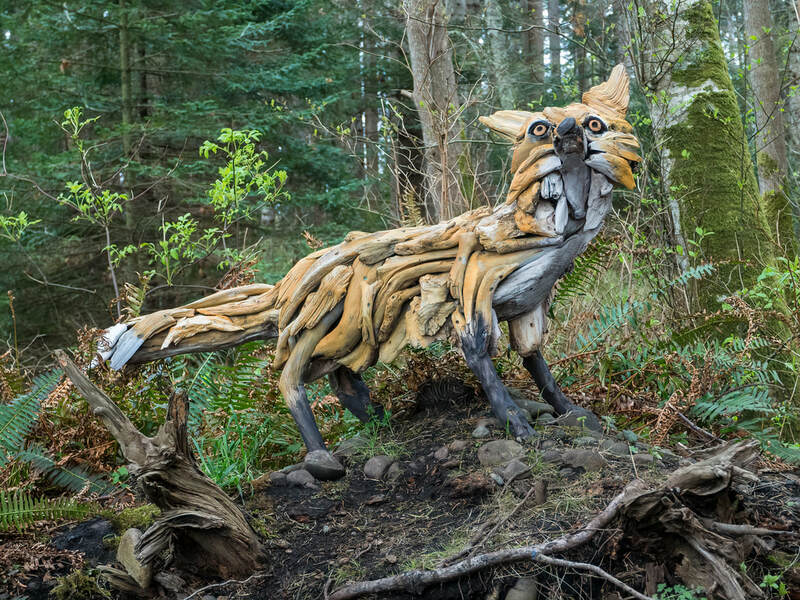 The fox is a new arrival, and is most impressive, having been mounted on a small mound beside the path. Some of us walked right past it, without realizing its presence. The bears have been around for a while. No one knows who made them or for that matter who owns them. Suffice to say they add interest to one of our favourite walks. Use the LINK to see the rest of the photos. Coffee was at The Country Market along with lots of chat! The Ship's Point area was the destination for our Birders this past Friday, for a last check on overwintering water/shore birds. 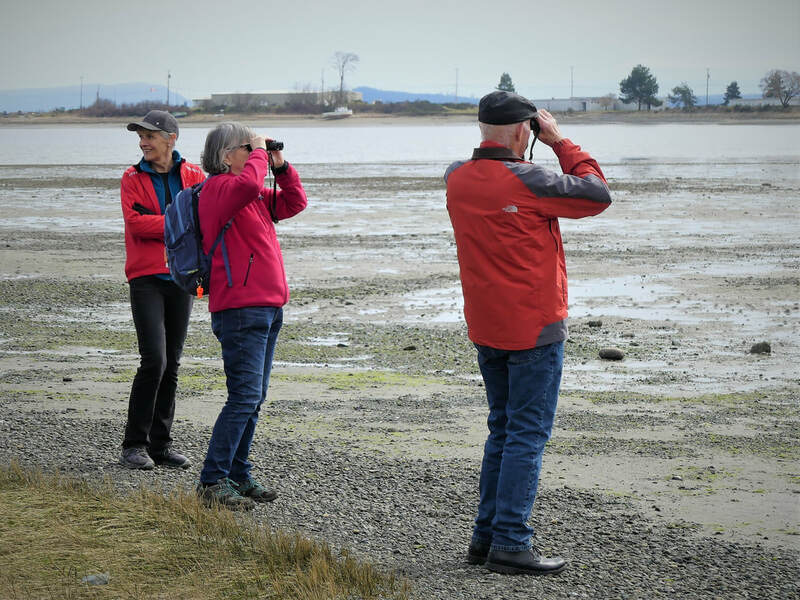 We checked out three locations - a marshy area, Ship's Point and Mud Bay, finding birds and other representatives of nature along the way. Birds sighted were: American Robins, Song and White-crowned Sparrows, Mallards, Gulls, Bald Eagles, Great Blue Herons, Common Mergansers, Oystercatchers, American Wigeons, Buffleheads, Canada Geese, Green-winged Teals, Chickadee, Hummingbirds, Crows and a Ruby-Crowned Kinglet. 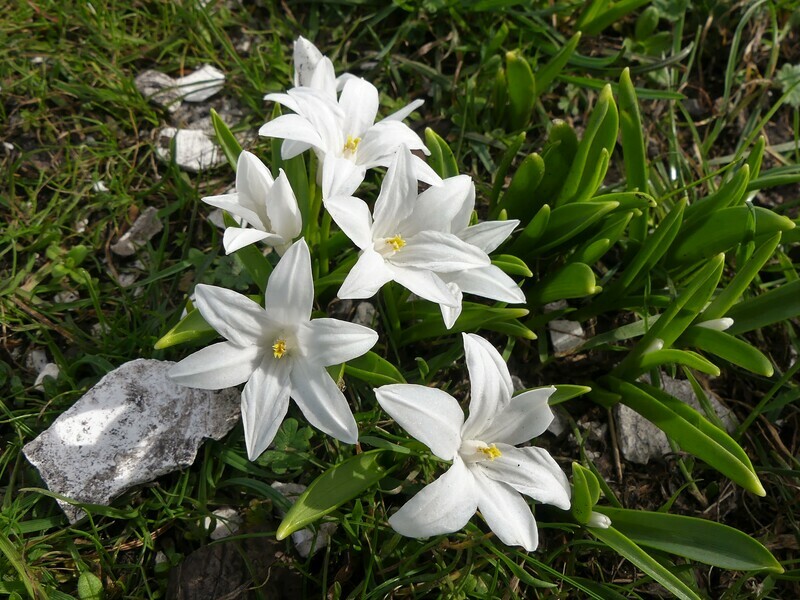 We were also quite drawn to a sleepy Sea Lion that was resting on the rocky shore and to floral signs of spring - Fawn and Chocolate Lilies plus a variety of spring blossoms. A lovely outing, all in all. The first four photos below are contributed by Ian; the remainder by Dawn (please note that I include photos that are not of great quality if they provide distinguishing features of birds sighted. The birds were often a fair distance away or obscured by branches and leaves). 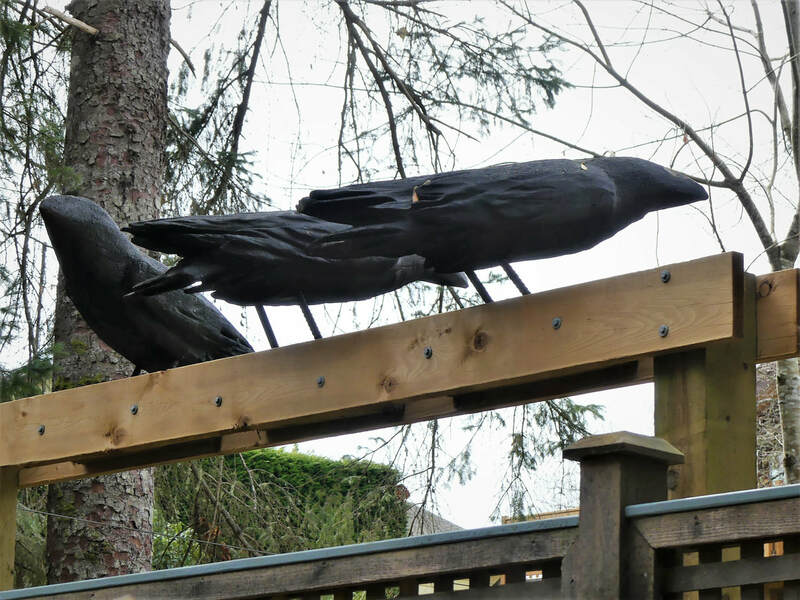 Click on the ​link to view the photos taken by Bill. Thanks everyone! After the unusually dry March Mulligans Golf course was dry enough and the weather kind enough for 18 golfers to take part in what was for many the first opportunity to swing a golf club this year. Inevitably the results were variable, and an above average number of balls were contributed to the ponds around the course. Two members boasted of three in the water, but put it right by each finding two other balls to replace them. Only one score card was seen by the writer, and it was of record breaking proportions, but not the sort of record that needs advertising. We all enjoyed relaxing on the patio with assorted beverages after our efforts-not bad for the 12th April. No photos available-next time I will remember to bring the camera. ​In a break from the rain, Tuesday was perfect for a walk, and with our numbers reduced to 7 because of competing Snowshoers trying to get a last shuffle across the snow, we walked down from the Comox Dam toward Nymph Falls for 45 minutes and returned. I don’t think that we had as much fun as the snowshoers, but the walkers tend to wait to have beverages after the walk, rather than open the bar in the middle of the activity as evidenced by the photos in the snow! We enjoyed our coffee, without stimulants, at Mudsharks, where we were able to sit outside on the patio on the 9th April. That has to be good! Thanks to Heather for the photos-we all moved when she took the group photo, the skunk cabbage didn't! This concludes the Winter spring series. We will have movies for the group as good one come available, in the spring and summer. 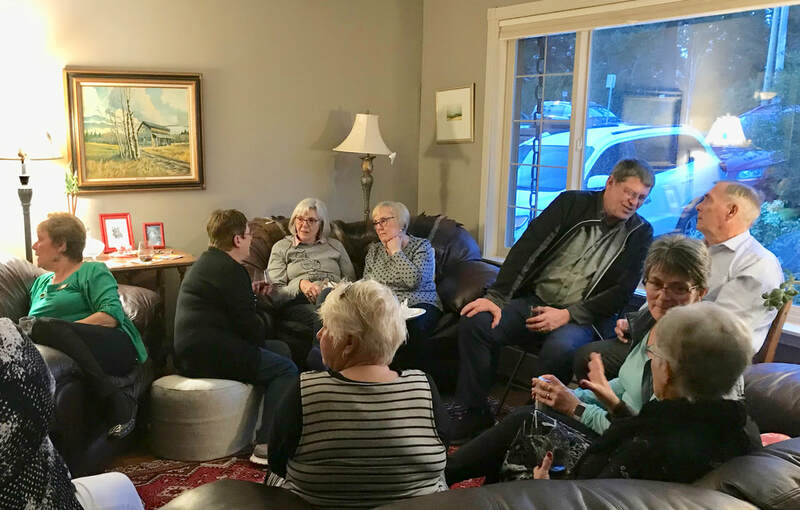 The group communed with one another afterward at three different restaurants. I'm assured that March was indeed a great month for movies at the Rialto Cinemas. For our final outing of the season, ten of us wandered around Paradise Meadows. Once again, we had picture perfect weather, clear skies and a balmy 7 to 10 degrees. During our lunch break, with an assortment of beverages (read alcohol) and cookies, we decided to hold Winter Olympic try-outs for the luge and skeleton teams. Although there was not a clear winner, we certainly had more than a few chuckles. Upon our return to town, we stopped at Mudsharks for our usual debrief. Thanks to Bill J, Cheryl, Dawn, Lindsay and Katie for the photos. Click here to see all of Bill Jorgensen's pictures. 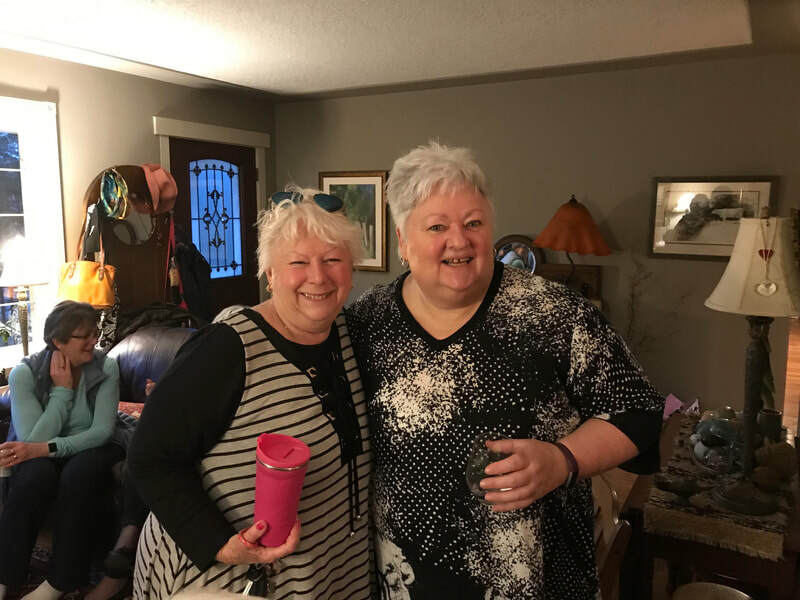 The First Tuesday fundraising concert for April featured Sue Piper and Julie Matthews. We found out near the end of the concert that it was Julie's first public performance as a singer. That came as quite a surprise. Julie and Sue delighted a very attentive audience. As is customary for this concert series the featured artists were joined in a few songs by other musicians from the audience. Donations totaling $1,100 were raised for the Comox Valley Transition Society. Photos from Facebook by John Simmons. Coffee and chat was enjoyed at the Country Market. 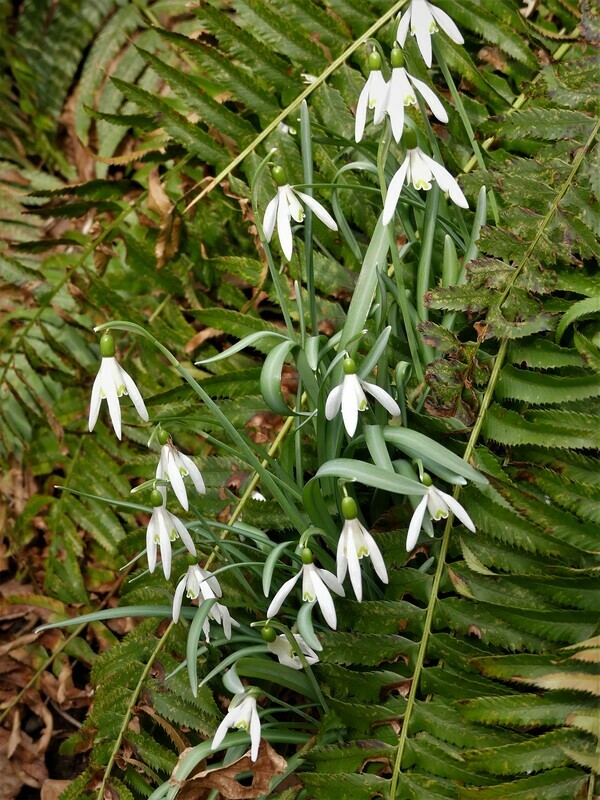 The weather was fine, the trail in great shape, and flowers were starting to come out. Lovely! 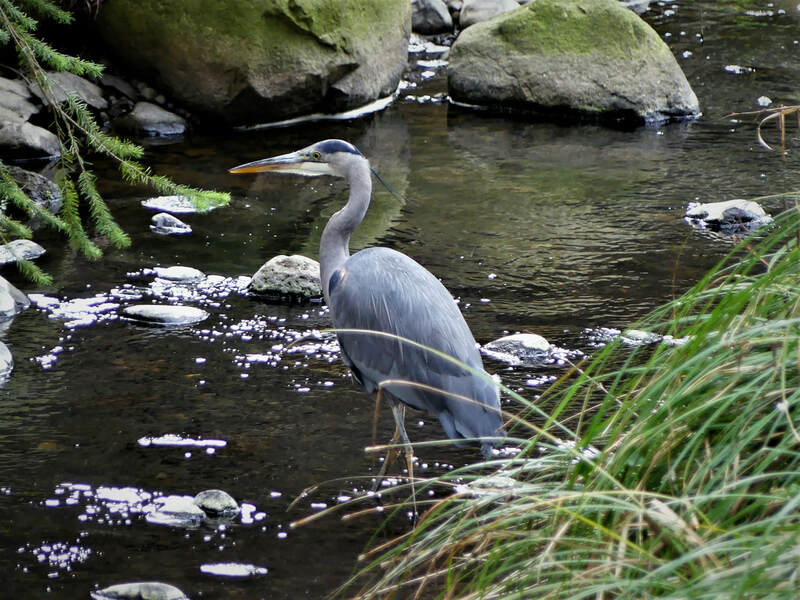 Friendly people on the trail pointed out some interesting art work, and a heron as still as glass. This plus lots of good conversation. What more can you ask for. 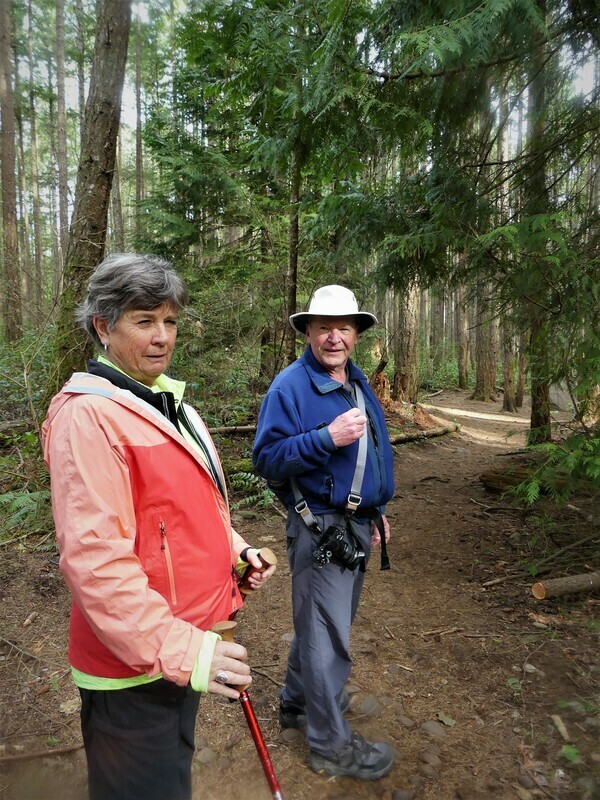 The Hiking Group enjoyed a sterling day on April 1st, following a new route taking in the East side of Puntledge River and lands adjoining Comox Lake (check the last photos below, which show our route details). Bill Jorgensen was our hike leader today, enthusiastically pointing out new sights and interesting features of the landscape. We were all quite taken aback and very impressed with the low level of water in Comox Lake. Wow - we'd better get some serious rain soon or we will be really cut back on water usage during the summer! Our lunch break was located on a lower bluff in the Comox Lake Bluff area, where we had a lovely view of the Glacier above the end of the Lake. Blue skies rounded out the panorama, enjoyed by all. On our return route, we visited a large Douglas Fir, where it took 5 of us plus a long stick representing a sixth person to link up around the tree - a good size indeed! The outing ended with a debrief at Mudsharks café. Links to Bill Jorgensen's and Steve Ray's photos complement the ones provided by Dawn Moore below. The bird outing this month took place in the Little River Ferry area. Our route took us on a loop, from the Little River Nature Sanctuary Pond, through a subdivision to the seashore, along the shoreline to the ferry terminal, which we crossed over to get to the mouth of Little River. We then walked up the Little River until reaching the subdivision once more and returning to our cars. Lots of bird sightings meant rather slow progress along the route, but we spent the time quite enjoyably, always happy to make our next bird discovery. The draw to this area is the exposure to a number of landscapes, each having its own birdlife, so we generally see a good variety. The excursions list? : Red-winged Blackbirds, American Robins, Great Blue Herons, Mallards, Song and White-crowned Sparrows, Northern Flickers, Spotted Towhees, European Starlings, Crows, Ravens, Gulls, Juncos, Bewick's Wren, American Wigeons, Eared or Horned Grebes, Red-necked Grebes, Red-breasted Mergansers, Buffleheads, Common Loons, Rock Doves, Pine Siskins, House Wrens and Bald Eagles. Lots to discuss at our Tim Horton's debrief. 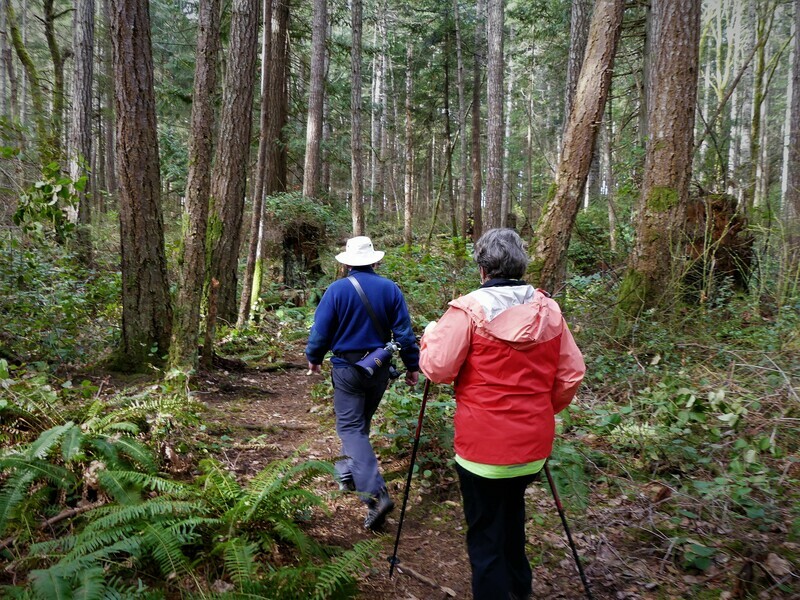 On a lovely spring day, a number of Regular Walkers gathered to wander the NE Woods trail system in Comox. In the absence of our Group leaders, who are off holidaying, Bill J. took up the lead and introduced us to a new route which meandered all over the area. We enjoyed the interesting new vistas and since it took an extra half-hour to complete, were quite ready for our coffees at QF afterwards, quite content with the outing. Check out Bill's photos at his Zenfolio link . The Elk Falls trail system (Elk Falls-Millenium-Canyon View trails) by Campbell River was the route of choice for Sunday's hike and what a nice day it was! We so enjoyed the sunshine and just-right-for-hiking temperatures. 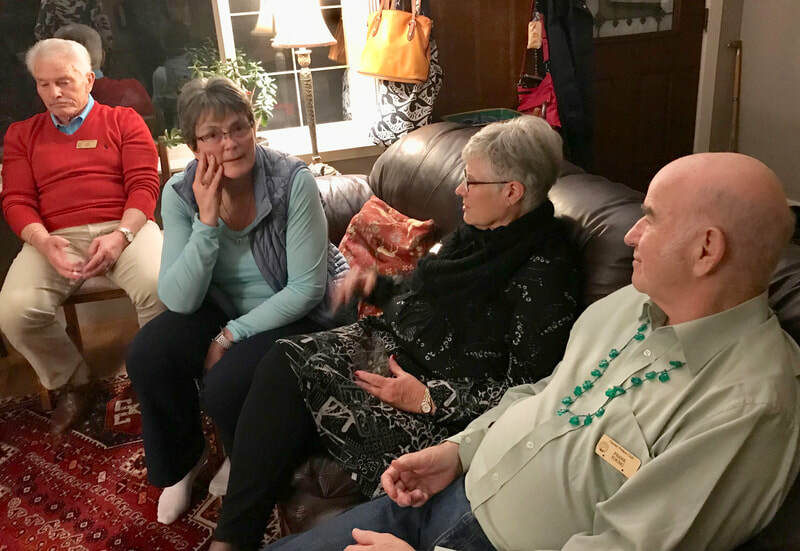 Co-leaders Gil and Dawn were just back from their month in the Caribbean and were thankful not to be contending with the freezing temperatures and icy conditions present during their absence. The skunk cabbage is making its appearance and we were thrilled at one point to sight a Red-tailed Hawk perched on a branch above us. Our 'debrief' was held at the Riptide Pub. Photos were supplied by Steve R. and Dawn M.
Twelve of us, including a guest, headed up to Ramparts Hill for a fun day in the sun and snow. With temperatures soaring to 8 degrees and tunes from Bill's 21st Century boom box, suggested by Steve and Gary [where were you, Gary?? ], we bopped our way to the Browns River lookout. Attire included shorts, tee shirts, Hawaiian shirts and anything green (in honour of St. Paddy's Day). We made our way along logging roads this time in order to take full advantage of the sun. While at the lookout, we stopped for a lunch/snack break and celebrated all things Irish with a shot of Fireball. For Bill, it was a particularly good day as it was free of whiskey jacks. On the way back to the vehicles, and after climbing a significant hill, we were rewarded with stunning views of the Salish Sea and the Coast Mountains. Upon our return to town, we debriefed at the Avalanche for refreshments and talk of perhaps one more trip to the Meadows. Thanks to Cheryl, Katie and Steve and for the photos. 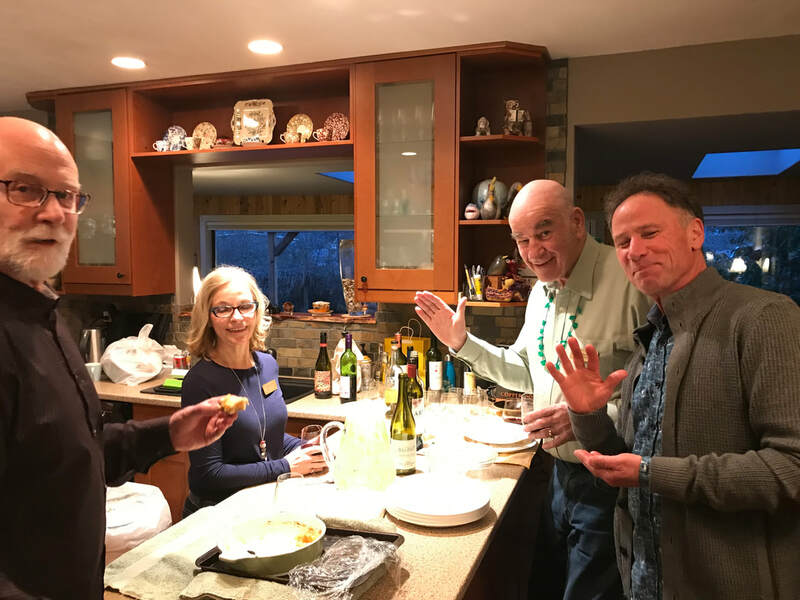 There was plenty of good St. Patrick's cheer and delicious appies when the group gathered at Shelley Combs' home on Friday, March 15. 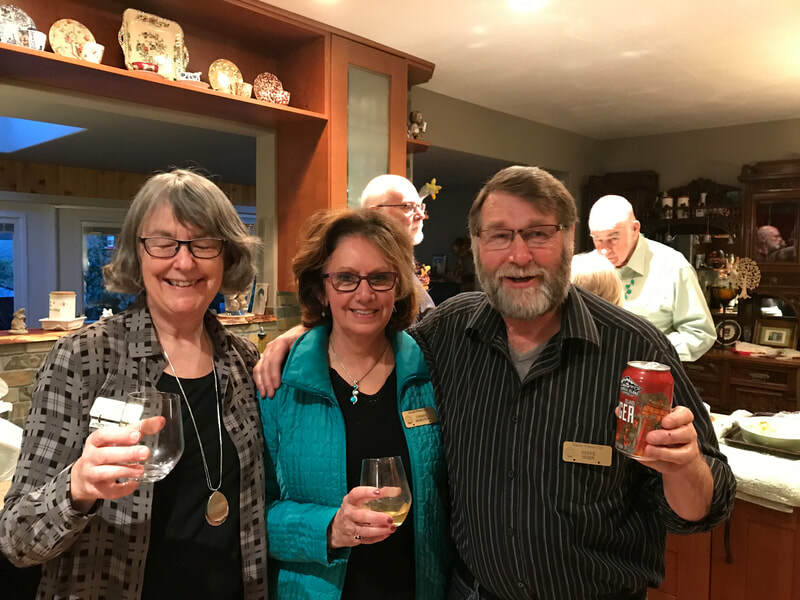 Thanks again for hosting, Shelley! Thirteen of us headed up to Raven Lodge to check out the extension of the trip that we did last Tuesday. On the trail, we were again afforded stunning views of the mountains. With Mount Albert Edward to our left and Big Ball Mountain ahead, we split off the main trail to travel down to the “new” trail. With fresh unbroken snow ahead, off we go down the trail, forgetting for a moment that the return to the Lodge would require an extensive climb. Before taking on the elevation gain, we stopped for a snack for ourselves and the ever present whiskey jacks, much to Bill's chagrin. As the day warmed up, the snow became softer and the buildup of snow sticking to the bottom of our snowshoes at times felt like we were walking on bricks. We certainly had a great workout on this trip. Our usual debrief included lively chatter and some welcome nourishment after finishing this excursion. On our last excursion to Lake Helen McKenzie, we noticed a trail heading off to our right. It looked interesting, so Bill, Rosa and Steve checked it out and agreed that a variation of our trek should be added to our repertoire. It seemed that around every corner there was a new vista to appreciate. Under crystal clear blue skies, the Beauforts were absolutely stunning, and at one point on our way back, we were treated to panoramic views of the ski and tubing runs. With deep powdery snow, we were able to satisfy our impulse to bush wack down a hill to join up with a trail that crossed the Meadows. Back at the Lodge, we had our usual debrief. All in all, another excellent day in paradise. Thanks to Bill and Steve for the photos. 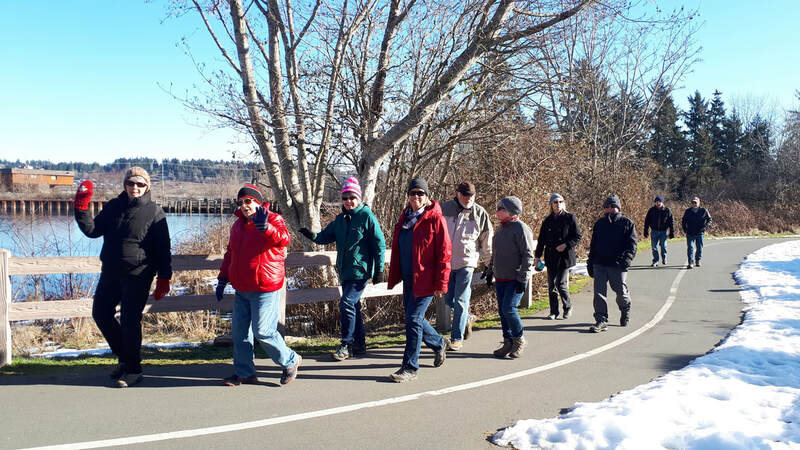 On a chilly Sunday afternoon Karen Barr led us on a delightful 11 kilometer tour of Comox. The route included forest trails, beaches, the Goose Grind, Greenways and side roads. Our debrief was at The Mill Coffee. Thank you Patti for the pictures. 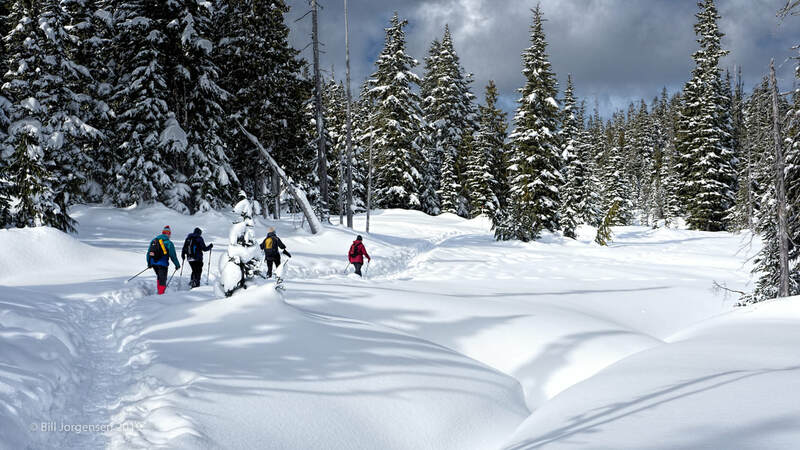 Mount Washington Paradise Meadows offered a pristine day to 5 snowshoe enthusiasts who made the most of the excellent conditions. We set out under friendly skies of mixed sun and cloud and virtually no wind. The temperature was invigorating and the trail offered a dusting of new snow over a very thick base. We travelled along Old Cabin Loop trail as well as the Crooked Creek trail. Our route included a detour along a trail not yet explored which showed us some very attractive scenery. After a highly conversation lunch back at Raven lodge, we finished off with a fun afternoon snowshoe out to the lookout. ​Conditions could not have been better for our trip up the hill. There were several inches of fresh powder, and we did not encounter any icy patches. Ten of us completed the Battleship/Helen McKenzie loop. On the way we spotted a snow cave which, naturally, had to be checked out by an adventurous member of our ensemble. Onward and upwards to Helen McKenzie, where we were in awe of the expansive views. We cut across the lake, making our way to Battleship, where we stopped for a short lunch/snack break. Of course the ever present whiskey jacks appeared, but Bill managed to finish his lunch without having to share. Then, down the trail back to the Lodge where we convened for our debrief. Thanks to Bill J, Katie, Lindsay, Michele and Steve for the photos. The weather hasn’t been kind to us Islanders for the last 3 weeks. We had to cancel the walk on the 12th February because of the snow, this was the first time since we started walking in 2013 that we had to cancel it completely. Last week and again this Tuesday we walked the Air Park as it was really the only safe place to go. Still there was a good group out and we enjoyed the exercise and fresh air not to mention the coffee and chat after. Let’s hope we can get back to the trails next week. With our favourite trails under varying amounts of snow, we stayed close to home (especially the coordinator of the day) for a 9 kilometer loop through East Courtenay. Our hike included informal trails and closed logging roads that were covered with packed snow as well as paved city Greenways that had been plowed. A few short stretches of roads and sidewalks were used to link it all together. The snow and some slippery spots made for more of a workout than the 9 kilometer distance would suggest. The debrief was at a cute house where our adventure began. Thank you Cheryl and Katie for the photographs. As there hasn't been a lot of snowfall at the lower elevations this year, we've only now made it to Anderson Lake. This is a relatively short trek for us but still well worth the trip down to the lake. With blue skies and a temperature of +2, it didn't take long for most of us to start 'de-layering'. As the lake was far from being frozen over, we made our way above the shoreline but still encountered the odd slushy area. Perhaps we were closer than we thought to the beach. After our lunch/snack break, we proceeded back to the vehicles, having to break trail up to the logging road. Once back in town, we had our 'debrief' at the Whistle Stop for nourishment and much needed re-hydration. Thanks to Katie and Steve for the photos.